Double click on the item to start editing. Confirm changes by clicking on 'Ok', or reject changes by clicking on 'Cancel'. 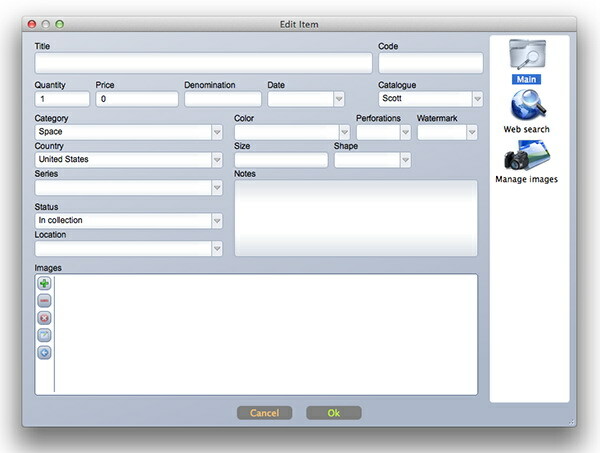 The toolbar on the right side of dialog is used to access various item sheets and additional functionality - 'Web search' and 'Manage images'. Enter search phrase in the edit box (1) (for example, 'speed'), click on one of the buttons below edit box ('ebay', 'colnect', ...) to start image searching. Double click or use right mouse button to add images. To get the image from other websites, enter the URL in the edit box (2), click on 'Open URL'. You can use right mouse button to add images directly from the website. 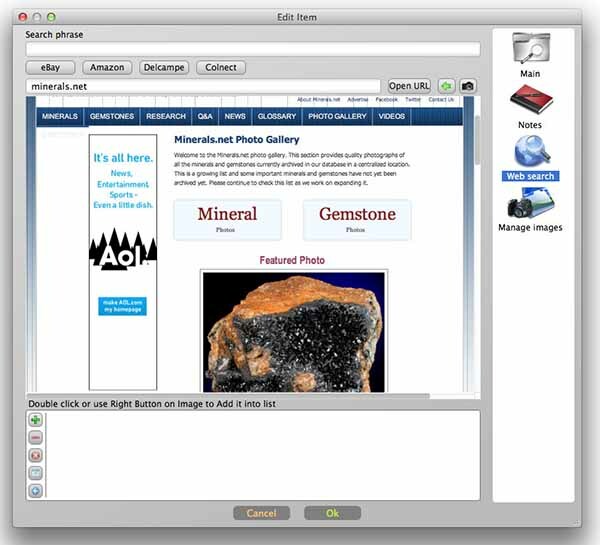 Or use 'Capture' button (3) to capture the whole webpage as an image. Later, you can edit these images using embedded image editor (crop, adjust brightness/contrast, etc.). 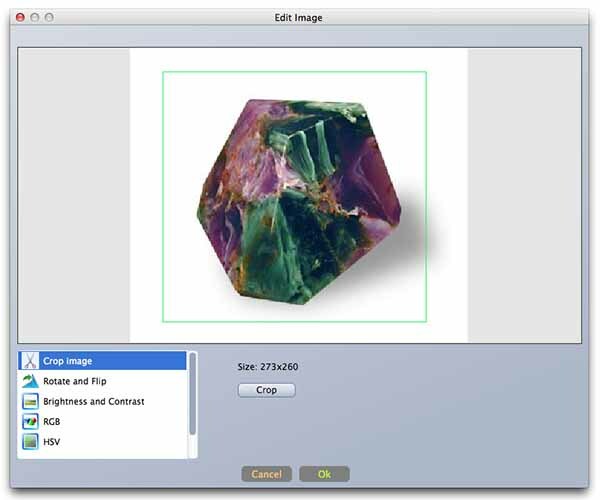 Select one of the available image editor tools from the list: Crop Image, Rotate and Flip, Brightness and Contrast, RGB, HSV. Adjust settings, click on 'Ok' to confirm. To crop image, use tool 'Crop Image'. Using mouse mark the rectangle area of the image. Click on 'Crop' button to crop image. Click on 'Ok' to confirm changes. 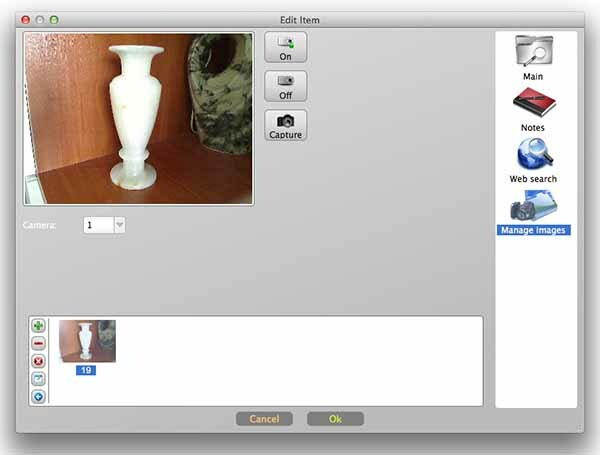 This tool can be used to capture images to the database directly from your camera. Connect your camera. If you have many cameras (internal and external), choose your camera number in the 'Camera' combobox. Click 'On' to start camera preview. Click 'Capture' to add current photo to database. Click 'Off' when done. You may leave your camera working, so you don’t have to start it again for the next item. 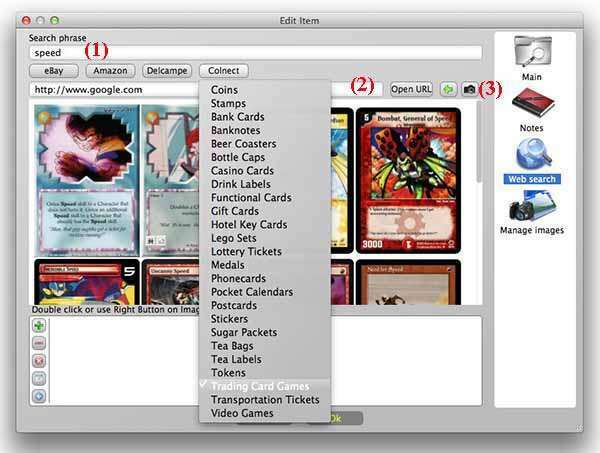 Select more than one item (use Alt, Ctrl/CMD, Shift buttons + mouse click). 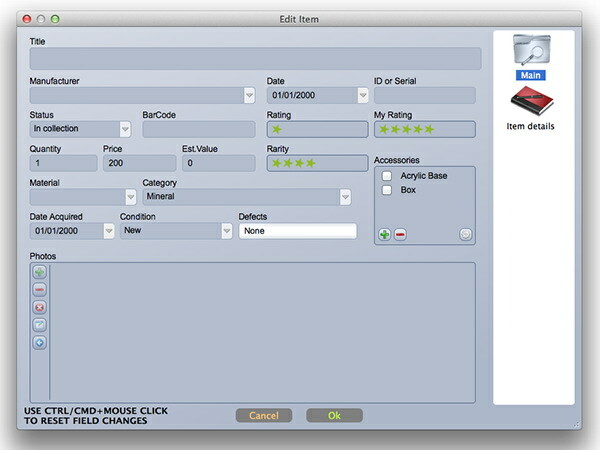 Right-click your mouse on selected item, choose 'Edit Selected'. This will open bath items editor. All fields are grayed out. All gray fields will be left unchanged. Enter the new data. If you want to cancel one of the fields, hold CTRL/CMD button and click on that field. They will be grayed out and will be not applied to editable items.